Insufficient farm infrastructure is one of the main causes of lameness in dairy herds. 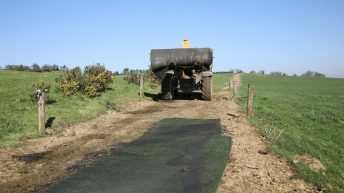 This could be anything from poor roadway surfaces, sharp turns entering or exiting the yard, slopes on passes or around the farmyard and insufficient feeding space. 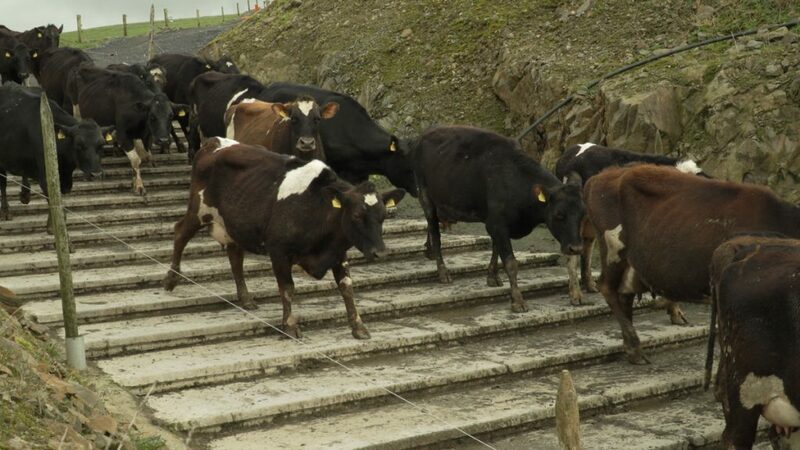 AgriLand travelled to Co. Meath to see how one dairy farmer – instead of leaving a steep slope entering his collecting yard – opted to install steps to prevent animals becoming lame and to allow him to locate his parlor just where he wanted it. The farm (Lough Crew farm) was converted from a beef and sheep operation in 2016 and is now home to over 280 cows milked through a 26-unit herringbone parlor. “The site that we got planning for was quite a difficult site. 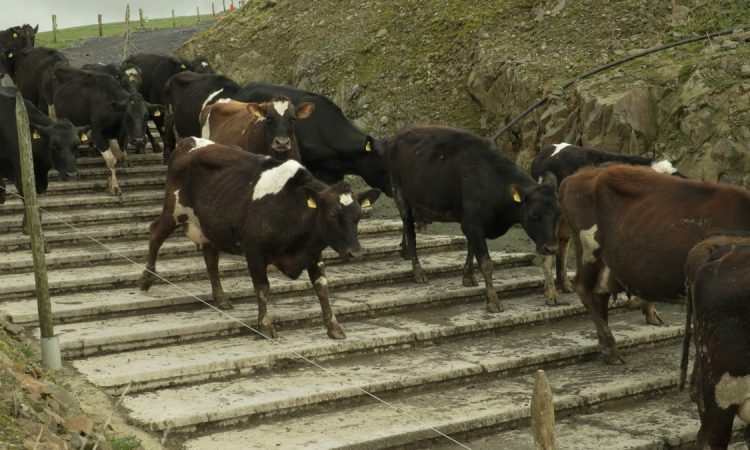 There was a 4.4m drop in the final 30m running into the milking parlor and it was just unfeasible to have the cows walking down that gradient; so steps were the only option really,” explained Brian Murphy, the owner of Lough Crew farm. During the visit we also met Brian Gilsenan who is currently managing the farm. He explained: “The farm is one of a kind; there are a lot of hills and steep gradients. Especially where the perfect site for the parlor was, there was a very steep gradient down into the collecting yard. 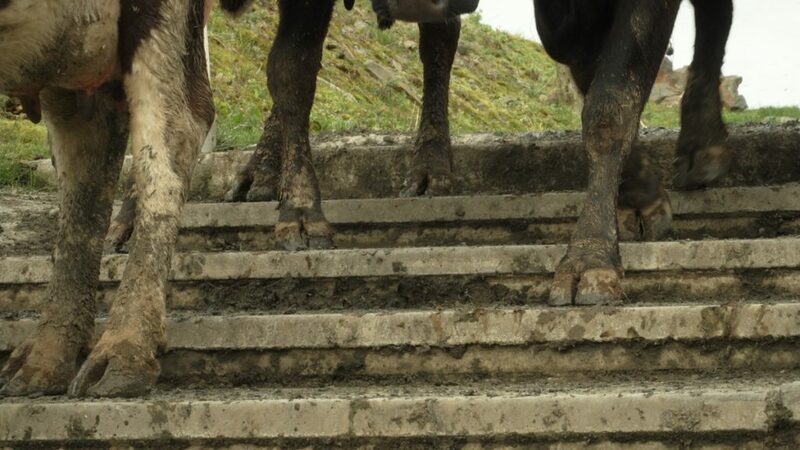 “We decided to put in steps because we had noticed on other farms where cows were walking on slopes, they tend to become slippy which leads to cows slipping and falling. 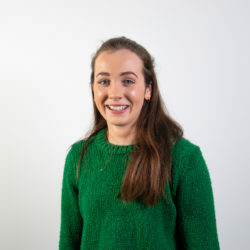 “Especially during the summer when a skin comes on the slope, but with the steps there isn’t this problem because they have a flat surface to walk on. “The cows took to them really well. The first day we walked them out they took to them like a duck to water; there was no hesitation about them at all,” explained Brian. The steps seem to be working very well on the farm. Cow flow into and out of the collecting yard is excellent and the cows have no trouble walking on them. “We have no problems with them, but you just have to be aware that stones can come onto them. So, it is a good idea to have a brush at the top and keep the first few steps clear which avoids them going down any further,” concluded Brian.